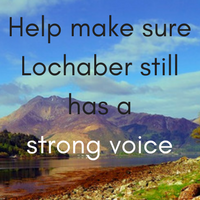 Andrew Baxter is a well-known, hard-working community campaigner in South Lochaber. Living and working in Kinlochleven, he is dismayed how more council decisions are made in Inverness rather than in Lochaber. That, along with the culture of secrecy at the council, with many discussions affecting our everyday lives made behind closed doors, prompted Andrew to stand as an independent councillor for the Fort William and Ardnamurchan ward. In May 2012, he was elected taking the first position on the list with the greatest number of first preference votes. He believes that the area needs a stronger independent voice to fight against crazy council decisions, wasteful spending of taxpayer’s money and to stop things like the closure of rural public toilets and the scrapping of weekly skip collections happening again. Andrew is often outspoken, speaking his mind when he thinks our community is getting a poor deal. Although that may upset “the powers that be”, being outspoken means, he is prepared to stand up for a cause and fight for local interests. As Chairman of the Kinlochleven Community Trust, he has spearheaded recent efforts to continue regeneration of the village. This includes the creation of a community garden and visitor information point that has transformed the centre of the village. Working with other directors, he is currently developing plans for a small-scale hydroelectric scheme for the village that would raise revenue to fund on-going community projects. Andrew was the first Chairman of the Leven Centre, during that period he led a team that set up the joint community facilities with the new school complex. Owning the Post Office in Kinlochleven and operating a weekly outreach service in Duror, Andrew understands the problems faced by smaller rural communities at first hand. He also runs a small campaign consultancy with clients across the United Kingdom, as well as providing consultancy and training services in developing countries for the Westminster Foundation for Democracy. As a proud father of two young children, Andrew has a particular interest in the provision of services for young families. Already his young daughter has inherited her father’s debating skills and steely determination. In his spare time, he can be found walking in Lochaber’s stunning hills or reading – but not at the same time!